Yes! I Do Buy Polish Design! Clothing has always constituted a "body language" – it was, and is, an indispensable element of our conscious existence. Footwearis an important, integral part of clothing. It can be the finishing touchof the styling, but it can also be its beginning and determining factor. 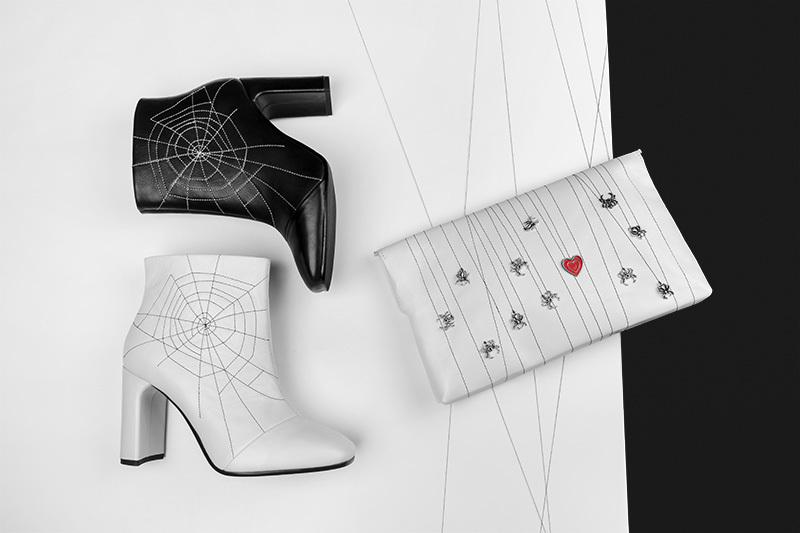 In designing my own collections of shoes and handbags, I look for inspiration in the surrounding nature, literature, history, art... On one of the pairs of shoes I have "woven" a spider’s web. I was fascinated by this unique and inimitable structure, the execution of which requires great precision and time. The intricately woven spider web became a pretext for me to search for new forms of artistic expression. This is how the "Bubbly Images" were created. I "wove" them out of balls of bubblewrap, which I connected with coloured string. Graduated with honours from the Faculty of Design at the the Higher School of Art and Design in Łódź, 2010. Diploma at the Faculty of Materials Science, Technology and Design at the Kazimierz Pulaski University of Technology and Humanities in Radom, 2015. She was a lecturer at the shoe design studio at the Higher School of Art and Design in Łódź, 2014–2015. Multiple finalist at competitions for designers in Poland and abroad, among others she represented Poland in the 1st edition of the Competition for Young Designers, organized by the European Textile Collectivities Association (ACTE) in Italy, 2011. She has participated in shoe shows and exhibitions in Poland, Germany, France and the United Arab Emirates, as well as in the 12th National Exhibition of Unique Fabrics, accompanying the International Triennial of Tapestry, Łódż, 2013. Her works can be found in the Virtual Shoe Museum collection in the Netherlands. She is the creator of several original women's footwear collections signed with her own name. She has cooperated with a number of Polish footwear manufacturers, including Wojas, Bartek, Acord and Kati.